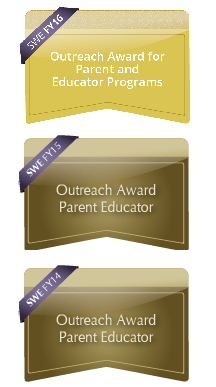 Dallas SWE's signature event, Design Your World - STEM Conference for Girls, received the 2014, 2015, and 2016 SWE Outreach Award for Parent and Educator events! Thank you for helping us make this event such a great success. Visit www.dallaswe.org to learn more about Dallas SWE. 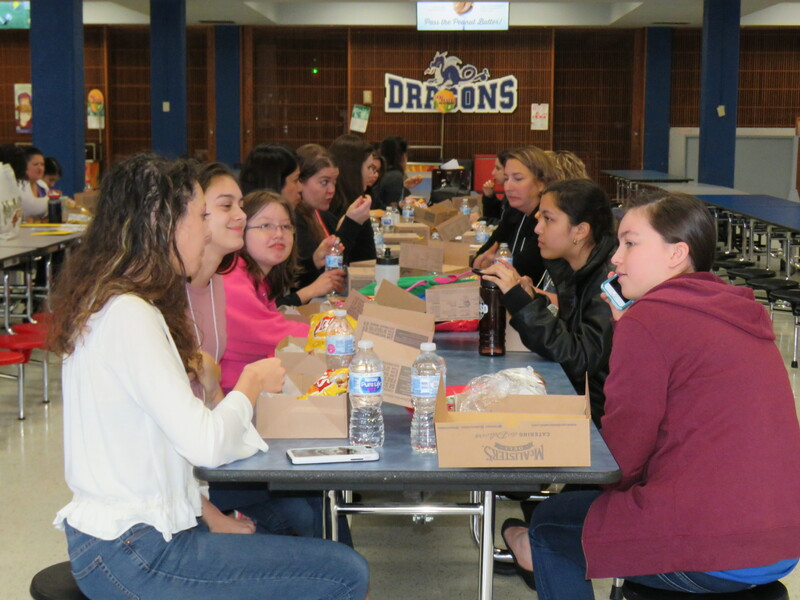 Our 13th Design Your World STEM Conference for Girls was held on April 14, 2018 at Seagoville High School P-Tech Academy! Despite many requests for an event for older age groups and in the south Dallas area, our attendance numbers and marketing traction for this event were definitely much lower than expected. However, the smaller group allowed us to try out some new activities and new check-in/out procedures and all of these experiences will inform the planning and execution of future events. By the numbers, 27 8th-12th graders, 5 parents and educators, and 40 volunteers made this an educational and fun day learning about science, technology, engineering, and math. THANK YOU to all of our generous corporate sponsors: Exxon Mobil, State Farm, Schneider Electric, Lockheed Martin, Home Advisor, Capital One, and Defy. Thanks to activity sponsors Schneider Electric, AT&T, HAK Electronics, and McAfee! We would also like to acknowledge the tireless efforts of our event coordinators: Terriekka Cardenas (Dallas SWE VP of Outreach and DYW Event Chair), Lynn Mortensen and Thi Dao (Volunteer Coordinators), Amanda Allsbrook (Registration Chair), Shelley Stracener (Marketing and T-Shirts), Rana Karimi and Zaineb Ahmad (Parent & Educator forum), Amber Kreceman (Student Activities Coordinator), Teri Cate (Logistics), and Liz Hainey (Fundraising and Food). You can find all of our event photos on our Facebook page album for this event! Thandi Montgomery of Radiant Girl, Inc. kicked off DYW with a bonafide Girl Power activity. The girls were armed with self affirmations reminding them that they can do anything. Then, Flavia Salgado, EBO O2C Lead, Information Technology, from McAfee delivered a very informative presentation regarding online safety which touched on pertinent issues such as cyber bullying, secure password, and how teens can protect themselves and their information from online predators. Students walked through mobile app development programming using Bitsbox software. Students learned about the basics of electro-mechanical systems and how electricity can be used to control mechanical devices. Students gained more in-depth knowledge of electronics and built their own circuit boards. During the Design Your World STEM conference, three Parent-Educator panels were held: Voices From the Field – What’s Really Out there; Raising a STEM Daughter; and [insert the title of the third panel here]. Each panel had content aimed for parents and educators to aid in their STEM students’ education and motivation. The first panel, Voices from the Field, discussed the panel members’ collegiate and early careers as well as overcoming difficulties, surprising things, and any advice for the STEM students. The goal was to answer any questions that parents had about their STEM student’s education and future career. Many of the panelists discussed their careers from their points of view as well as their support systems, hardships, and perseverance. The parents asked several questions about how the panelists handled the difficulties that came their way, how they motivated themselves, and what drove them to choose their fields. The second panel, Raising a STEM Daughter, was given by parents of daughters who chose careers in STEM. The panel discussed education, financial aid/scholarship issues, and any issues that the parents had discovered in helping to educate their children. The parents that attended asked questions about how to approach homework, how to set their STEM students up for success, and how to motivate their students in good times and bad. The third and final panel, was given by Dean Hogan, Executive Dean for Richland College in the Dallas County Community College District. Dean Hogan discussed the Dallas Promise, Financial Aid, and the many programs that are available to STEM students at Richland. The parents that attended asked questions to clarify what the Dallas Promise is, which schools are included, and how the Promise works. The parents also discussed how credits transfer as well as how starting at a community college could be beneficial. The parents that attended were very open and communicative about the needs of their STEM students and appreciated the panelists and the content that was focused on. They happily asked questions and participated in each of the panels. 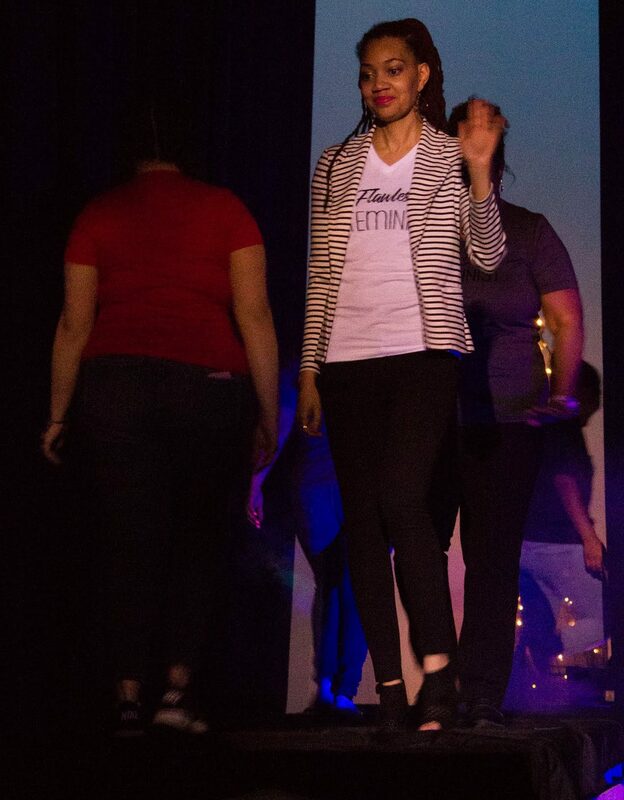 Participants and SWE members strutted their stuff on the catwalk wearing apparel designed by Zedbu Designs, a line created by SWE professional member Myra Walthour to celebrate female engineers. The ladies slayed the runway in tops that were “Sweet as Pi”. Participants that stood out above the rest with engaging questions and enthusiasm were rewarded with some amazing prizes. The smiles on each girl’s face and the knowledge we impart to their educators are why we continue to put on this event twice a year since 2012! The DYW STEM Conference for Girls is entirely volunteer run. Our next Design Your World STEM Conference will be in the fall of 2018. Stay tuned here, subscribe to our email list, or follow us on social media for more details when plans are announced!